Two majestic rivers, Beas and Satluj that flow through the state of Himachal Pradesh and gush through beautiful valleys rendering them with life are also home to hot springs at several locations. Not only are these locations scenic, but the mineral rich water of the springs is also considered to be therapeutic. Being one of the most prominent tourist attractions in the state, people from far and wide come here to witness the matchless charm and pious surroundings of the mountains. Located elegantly above River Beas, Vashisht is around 6km away from Manali town in Kullu district. This small village is now recognized around the world because of the commonly found hot water springs in this region. Here, all hot water springs emerge from the granitic deposits that cover a vast area in this segment of the Himalayas. The ponds or water ‘kunds’ are located at the center point of the village. The entire area around these springs is normally covered with enthralling greenery all through the year. The water temperature in these springs usually varies between 110°F and 123°F. 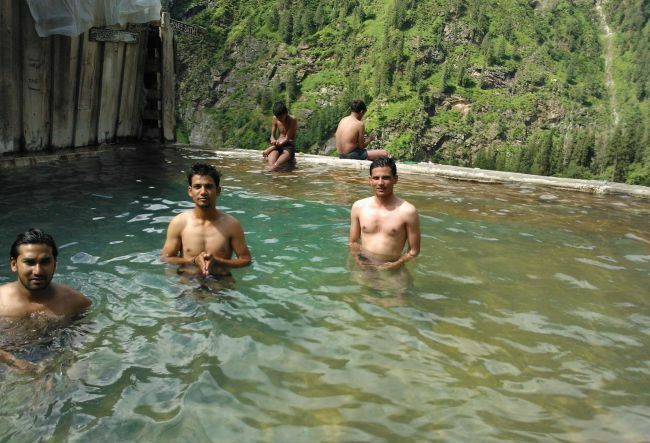 Many people visit Vashisht every day to take a dip in these hot springs. One water tank is made and kept reserved for women only. Vashisht hot water springs are a huge source of water for several other tourist places in and around Manali. 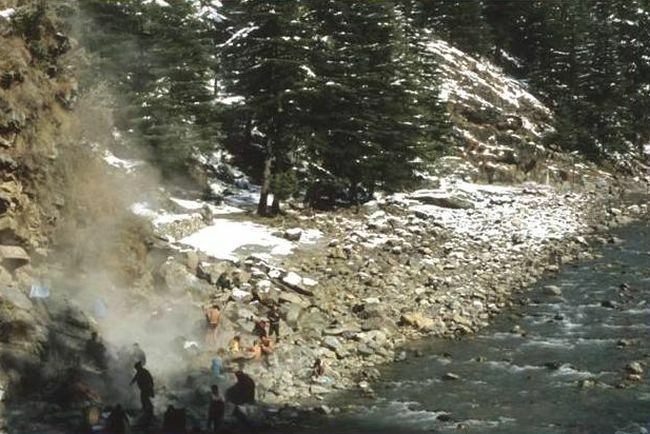 Situated at a distance of around 45 km from Kullu, the scenic hot springs lay in Parvati Valley. Confined to numerous groups of water sources, these hot water springs are positioned on the banks of River Parbati. They cover an area of nearly 1.3 km and emerge at different locations. All hot springs come out to the surface at very high pressure and are the water is also very hot. The temperature is high enough to boil rice, pulses, and vegetables. While there are no minerals such as Iron or Sulphur in the water, radioactivity is responsible for its excellent healing properties. People from around the country and abroad visit the springs to cure ailments such as muscular pains, arthritis, and rheumatics. Tattapani is always the first name to strike the mind when we think of hot water springs in Himachal. The meaning of the name ‘Tattapani’ itself is hot water and the springs here are pure Sulphur springs! This small, beautiful place is located in district Mandi, at a distance of 51 km from the Shimla city. 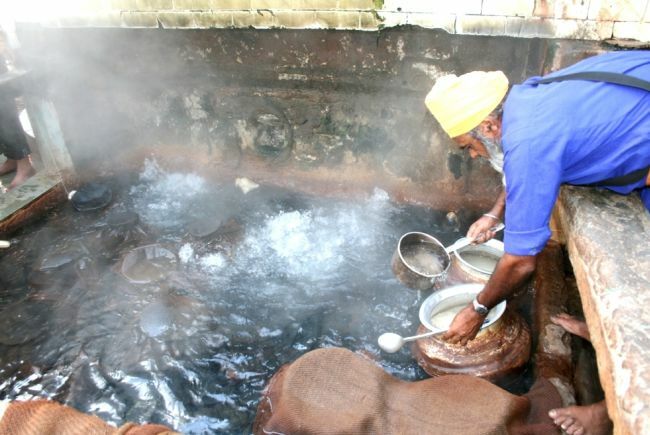 There are multiple Sulphur springs along the river Sutlej, each having the ability to cure a variety of bodily ailments, especially bones and joints-related problems. The water level of these springs keeps fluctuating depending on the water-level of the river. Khirganga is another equally beautiful and enchanting hot-water spring spot in Kullu district. About 26 km away from the main town of Kullu, this place is located on a steep meadow and makes an enthralling trek through hilly terrain. According to the Hindu Mythology, the elder son of Lord Shiva, Kartik Ji remained in Samadhi here for thousands of years. The term ‘Khirganga’ originated from the uniquely white color of water of these springs. The water gets this creamy-white complexion from Sulphur that is amply present in it, especially when it comes up to the surface. It is believed to have amazing medicinal properties and special importance for Hindu and Sikh visitors. Being one of the less explored tourist destinations in Himachal, Kasol village in Kullu has many surprises in store for visitors. Among them is the presence of hot water springs that lay at a distance of 32 kilometers from Bhuntar, Kullu. The spot is approachable by a footpath that stretches to an area of 1km. Here, hot water comes out only at one spot and water temperature is much lower than that of other hot water springs in Himachal. We would love to visit Khirganga, but some of my family may not be able to trek for a long duration. Is there any other way to get to Khirganga? 2. Can you give me directions to the hot spring in Kasol? No there is no alternate way to kheer ganga,, it’s just 3 to 4 hour trekking from barshani . Level is modrete, when you reach you forget all difficulties… It’s nice place silence of nature can feel… Such a nice place. I visited last year in July.. Stayed two days…. its a request to all the people planning to visit there . if you reach these places than please do not litter waste there . . Its a humble request we are left with only few paradise . Stop ruining them , otherwise do not go .